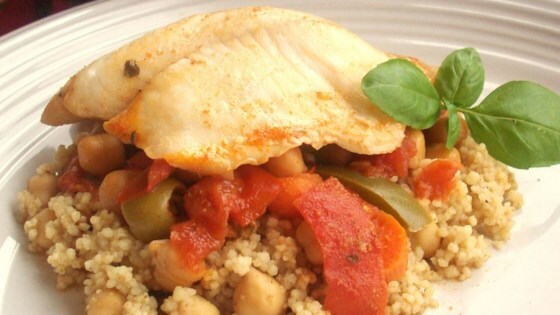 "This Moroccan recipe was passed down for generations in my family. We usually serve it on the Sabbath night and holidays. It is a favorite! This dish may be served hot or cold according to taste." Heat vegetable oil in a skillet over medium heat. Stir in onion and garlic; cook and stir until the onion has softened and turned translucent, about 5 minutes. Add garbanzo beans, bell peppers, carrots, tomatoes, and olives; continue to cook until the peppers are slightly tender, about 5 minutes more. Sprinkle parsley, cumin, paprika, chicken bouillon, and cayenne over the vegetables. Season with salt. Stir to incorporate. Place tilapia on top of the vegetables and add enough water to cover the vegetables. Reduce heat to low, cover, and cook until fish flakes easily with a fork and juices run clear, about 40 minutes. My picky eaters love this recipe! It's wonderful on a cold winter night. Real comfort food. Thanks Hanna!